Posh are aiming to play at Villa Park next season. 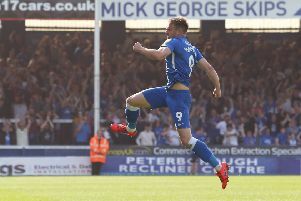 Peterborough United boss Grant McCann has dangled the carrot of playing at great grounds next season in front of his promotion-chasing players. Last Saturday’s (December 10) 5-2 win over struggling Chesterfield at the ABAX Stadium established Posh as a top six club in League One. Posh don't want to play at Brunton Park, home of Carlisle United, next season. But the season is not at the halfway stage yet and McCann has attempted to focus Posh minds on the job by hanging photographs of top Championship stadia at the club’s training ground. “I’ve asked the players if they want to play at Derby and Aston Villa next season or do they want to play at Carlisle,” McCann said. “They might also get the chance to play at Newcastle, if they don’t go up, and Norwich, and that is a great incentive for all of us. “It’s up to the players how successful this season becomes. We’ve done ok so far, but there is still a long way to go. On-loan Posh goalkeeper Luke McGee believes McCann’s unusual motivational tactic will work.